Of course other transformations should probably also be done to make the image look better. And then you can just use convert with no options to strip off the trailing garbage. Define what you mean by "bricked". The Kobo cannot really be "bricked" because it doesn't have any soldered-on non-volatile storage like flash or CMOS that can be corrupted. All the storage from the bootloader on up is in the onboard MicroSD card, which is easily imaged. If you followed the instructions given here you will have made a backup of your Kobo's firmware by disk-imaging the internal SD card. All you need to do is restore the backup you made of the Kobo's firmware. You can do this by opening the Kobo up and removing the microSD card, then putting it into a MicroSD reader on your computer and `dd'ing the backup disk image back onto it. "C"'s other comment was deleted because they posted their email address in it, and it didn't seem kind to leave it up for the spambots to harvest. That was ... silly. There's a reason I warned you should image the device first. Why on earth would you ignore the giant bold warning then go ahead and mess with your device? 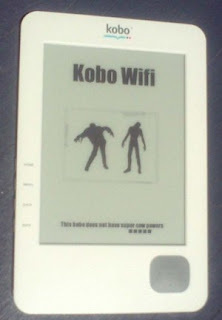 You will need to obtain an undamaged disk image of a Kobo Wifi. How did you mess it up? Did you upload an image that was too big? In the wrong format? Given the nature of your questions, I'm wondering: will you be able to restore the disk image once you have it? What operating system do you run? Do you have a microSD card reader? Are you willing - and able - to open up your Kobo to get the microSD card out so you can restore it? If you're on Windows you won't have `dd' so you'll need to use another raw disk imaging tool. A quick search suggests that WinImage (http://www.winimage.com/winimage.htm) might work, but I have NOT VERIFIED THIS. I'd boot an Ubuntu CD and restore the disk image using that myself, but I'm comfortable on Linux and usually use it. If you are not, I really cannot offer you the kind of detailed tutorial required to teach you to do this without risking doing more harm (like erasing your PC's hard drive instead of the SD card by choosing the wrong target disk device!). Give me a better idea of your level and I'll see if I think I can help you. I should be be able to help you find a suitable Kobo disk image, but there's only so much time I'm wiling to spend helping you use it. Press & hold the central button then turn on the device will reset it to the factory default settings.